Children are being pulled from their parents’ arms at the US-Mexico border, with no guarantee of reunification and no concern for the basic humanity of refugees fleeing violence. NPQ’s Cyndi Suarez wrote a feature today on the human cost of this terrible policy. But across the country, many Americans have drawn a line in the sand, and are pitching in to fight for children and their families. Perhaps the fastest-growing fundraiser was begun by Charlotte and Dave Willner, a couple from Silicon Valley who were some of Facebook’s earliest employees. They originally planned to raise $1,500 for the Refugee and Immigrant Center for Education and Legal Services (RAICES). The minimum cost of a bond to get someone out of detention is $1,500, but they can cost up to $10,000. The Willners leveraged their friends in the tech industry to help make their fundraiser easy to understand and support and got matching grants from larger donors. Julia Prodis Sulek of the Mercury News wrote, “When a potential donor was confused about how to donate, the Willners contacted a blogger friend who posted an explanation. When donors asked how they knew the Texas nonprofit was legitimate, they had a friend write up a post and add a link vouching for it.” By 9:45 am on Wednesday, they had raised $9,135,877 toward a goal of $11 million. NPQ has written about the phenomenon of rage donating before, and this week, many Americans have been seriously enraged. Hollie Larkey Ancharoff, a grateful donor, wrote, “Thank you for giving us something concrete to do!” In that, Ancharoff echoes the feelings of many Americans, who feel helpless in the face of such bare cruelty. Other organizations are responding to citizens’ wish to help. Multiple news organizations, including the Texas Tribune, Slate, ELLE, Money Magazine, the San Antonio Current, Nerdist, and InStyle, have posted articles about how to help the children and their families. 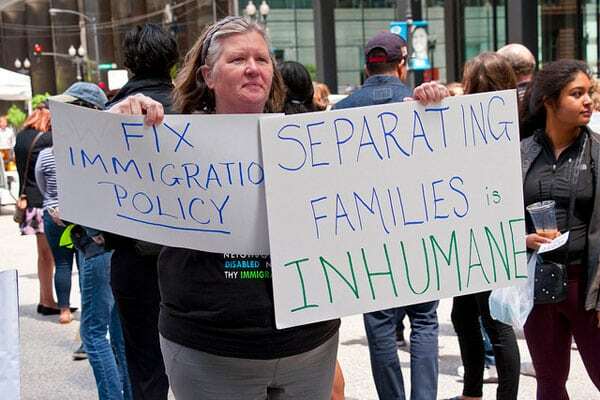 They include links to legal aid organizations like RAICES, which can represent families and children in deportation proceedings; humanitarian aid groups, which send food, diapers, blankets, and other supplies to children being held in tents and former Walmarts; phone numbers for senators and comment lines where citizens can tell their public officials to take action; and how to find protests in your area. Activist groups are mobilizing their networks nationwide. The National Network for Immigrant and Refugee Rights called June 14th a “National Day of Action, on family separations, initiated by We Belong Together and other partners.” NPR reported that the ACLU requested class-action status on Friday for their suit on behalf of an immigrant mother, known as Ms. L, who was separated from her daughter; they are collecting signatures on a petition to stop the separations.